Also known as Himalayan bowl or cup gong, a singing bowl, is a musical instrument used in Buddhist meditation and are traditionally played in monasteries by Buddhist monks. Singing meditation bowls were historically made in Tibet, Nepal, India, China, Japan, and Korea, and. The singing meditation bowl is made of metal, and may include precious metals such as silver and gold; while other can have a metallic makeup which includes copper, tin, zinc, lead, iron, and nickel. 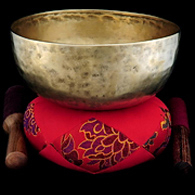 Commonly used singing meditation bowls are an alloy of different metals. Singing meditation bowls are played by hitting, striking, or slowly rubbing or stirring a wooden striker or mallet within or on the top of the outer surface of the bowl. The bowl produces a continuous harmonic sound when struck correctly. This sound is said to be relaxing and good for chakra, a form of meditation. The singing meditation bowl has been adopted by various other forms of meditation and is also used for yoga, healing, sound massage, sound therapy and chakra balancing. Singing meditation bowls come in different shapes, sizes, designs, colors, carvings and crafting. Some can be found with various religious themes and symbols like the Tibetan mantra chant of Om Mani padme hum, dragon carvings, mandala carvings, Buddhist religious symbols, among others. The art of making traditional bowls is now considered a lost art and most old bowls contain very little or no ornamentation at all. The bowls are mostly hand made, and fall into two categories: the hand-hammered (beaten) singing bowl, mostly used in Nepal and India and manufactured in the traditional processes; and the colored, carved and crafted bowl, which are popular for gifts, decorations, and souvenir items, mostly coming from the Himalayan region. Today, singing meditation bowls have become very popular, so much so that even people who don’t really meditate display it for its ornamental value. They can’t really be blamed as this singing meditation bowls come in such fascinating and exquisite designs. However, for people who use the singing meditation bowl for a much higher purpose, like meditating, see it as symbolic of human spirituality, representing human spirit as a vessel containing only the limiting nature of who and what we are. The outward appearance of a singing meditation bowl represents our constantly changing nature; from one moment to the next we are never the same even as events and interactions cause deeply influence these changes within us. While some events may lead to a complete upheaval in our lives, others may just create a subtle ripple that is forgotten as soon as it occurs. Whether or not we use them for them for meditation, a singing meditation bowl is timeless symbol of human spirituality and the frailty of the human nature. I so want a few different sizes of these beautiful singing bowls. Does anyone know a site where I can find authentic bowls? I would appreciate any direction anyone can give me. I don't know of any resources off hand, though myself I'm a big fan of ebay. How exciting! :) Thanks for sharing. Hello,Leila! I love "Singing bowls".